I am wanting to get some advice and confirmation on my VDSL install over the last 5 days. I was on ADSL with Slingshot but wanted a faster upload option. I am in a cable area but the Vodafone Caps are not appealing. I started investigating VDSL as an option and I have identified all the requirements needed to be able to get VDSL at my home. I looked at the attenuation and tried to identify the distance to the cabinet. 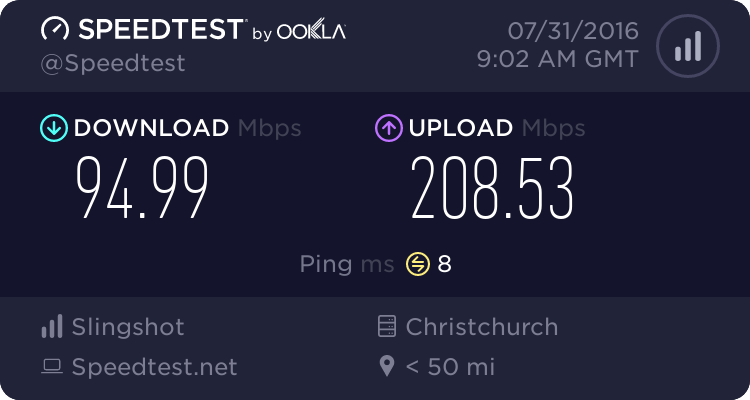 Unfortunately I did not make a screen shot of my ADSL line settings before the VDSL change occurred, but I knew Chorus has a hard line on the attenuation of 10.8dB and I knew I had to make sure this would be ok. I do remember that on my ADSL it was 13dB. I also know that between the modem and Chorus test there is about 2dB difference. So when I called Telecom and Snap about the VDSL. I was sure that I would be in the Chorus target range or just over it. My ADSL throughput before the VDSL change was around 20/1.3. Order was booked with Chorus to install my VDSL. A Tech needed to come onsite and install the master splitter. Friday the 22th Nov he came out, did the install. Told me that he tested my line before he came out and I look all good for VDSL. 30 min later splitter was installed, and we hooked the SNAP fritz!box 7360 up and nothing. DSL link did not want to connect. So he called home and asked them to switch the line over to VDSL. He told me that the modem mite not be configured correctly so went to his van and got his own modem. He never did a Snap VDSL before, only Telecom. Thinking nothing of it at the time. He tested the line and it came up with 13/1 on his modem. He called home again to make sure they switched me over to a VDSL profile. (Could not hear what the guy on the other side said), but the Tech told me that I may be over the 1km threshold and the system will automatically switch it back to ADSL. So I said but that speeds is not even what I got on ADSL? and he said it could be the VDSL profile. So he told me that I may not be able to get VDSL here. I said but you tested it before hand and you said it will be ok? So he said there is nothing he can do cause the system is automatic, do I want to switch back to ADSL? I said yes cause I got better speeds on ADSL than what it is now. 20 min later he called me on my mobile, and told me that he zeroed his van's mileage before he left my home and I am 900m from the cabinet, but when he tested the line I am 1090m from the cabinet. So he said I will not be able to get VDSL cause I am 90m over the 1km threshold. So here I got really worried, cause during my investigation I know there is VDSL profiles but there is no information that a VDSL profile will affect my line speed so that I am worse of than what I was on ADSL. So I called snap and asked them what now. "Chorus said I can't get VDSL and I have no ADSL at present." I have to say Snap was very helpfull but they could not do much until Chorus released the line. Over the course of the weekend I called Snap every morning and night to find out what is going on as I do not have any internet and do rely on it heavily for my VoIP phones lines and work stuff. Yesterday morning(Monday) I phoned again. Snap had put in another escalation to Chorus to find out what is going on. 1h later I got a phone call from Snap and was told that Chorus had canceled the order and they need to put in a new order to move my ADSL service over to Snap from my old provider. In the mean time I am getting SMS's from my old provider saying my line is now active and they are very happy I am on board. I phone them to make sure they do not reactivate my account, just wanted to make sure they are not stopping the request from Snap. I finally got internet back online last night(Monday) around 6pm. First thing I looked at was my line stats. I was horrified!!! I would not be able to get VDSL at this attenuation. My Throughput dropped by almost 7mbps. How is this possible, what did these guys do to my line? Finally got to talk to a tech at snap, he took about 5 min reading my novel on my account. (only a 5 day old account) He said on this settings Chorus will not come out to install VDSL, they will just cancel the order, and I said I know. But as you can see they have tried the install already so obviously they knew I was ok before? Right? So he asked me about how the line is connected, is there any wiring other than Chorus wiring involved? So I explained, the Wire is coming out of the ground into the box with the master splitter, then he installed a cat5 cable from the box to a Rj45 terminal, from that terminal to the modem. That cable was supplied by Snap but have changed it to just make sure its not the cable. So he said ok just need to make me aware that if they find that this is a wiring fault of mine I will need to pay, so I just reconfirm who owns the wire out of the ground and he said Chorus, Then I said fine, there is no wiring of mine in the loop. So a call has now been logged with Chorus. 1) what the guy said about the system automatically switching me back to ADSL, is that true? if so why do we need a Tech onsite? 2) Could the Master splitter affect my line? I can't disconnect it to test be cause I need to cut the wires. 3) Could he have put me on another wire or something? He was at the cabinet before he came over and after, and he did say he tested it before hand and all was good to go! 4) this 1km(10,8dB) If I was just over would that mean I will not get VDSL at all or would I see a bit of an improvement from my ADSL? I was expecting a bit better service than the ADSL, but I do understand on the current settings it will never work. I am now waiting for a call from Chorus to come out and have a look what is going on. Is there anything I can do or get the Chorus guys to do, to get me back in the VDSL window? Sorry about the big novel. I did fix it now!! If your attenuation on ADSL has gone from 13dB to 36dB then something has clearly gone wrong, and an attenuation that high would have significant detrimental effects on VDSL. It is possible it is a faulty master splitter, or poor joint in the new wiring - uncommon, but possible. I did ask him about the master splitter but he said it will not affect the line, will only make it better. If the modem connected there I would have told him he messed up, but the weird thing was, the modem only started connecting after he called me when he was at the cabinet. So this could be something he did? or not done correctly? If Chorus are booked to come out, I'd suggest making sure the tech is aware of the jump from 13 to 36dB attenuation - it's an indication of a defective joint or similar, and should assist them with diagnosis. Cool I will tell him when he comes out. Is there a way that I can find out exactly my distance from the cabinet? In my view new connections should come with a disclaimer --- it may take several weeks of trial and diagnosis to stabilise your new connection during which time you may be intermittently or wholly without internet/phone service. Your issues are probably not abnormal for new connections. Just wait and see what chorus has to say. A master splitter should only improve your connection unless it is faulty or installed incorrectly --- if it were installed incorrectly though, I don't imagine you would have any vdsl. I wonder, if it is possible you have a faulty fritzbox -- this happened to me but in my case it wouldn't connect at all. Maybe I should configure my old Linksys ADSL can see how that looks. The think that I am frustrated at is that if I had any indication that I would not be able to get VDSL I would not have signed up for a 24 months contract. Would have gone cable and just reduce my downloading and only profile to accommodate the vodafone Caps. Wow you must be so frustrated and anxious. I'm sure you'll get it sorted out though. So Snap said Chorus will be coming out today.